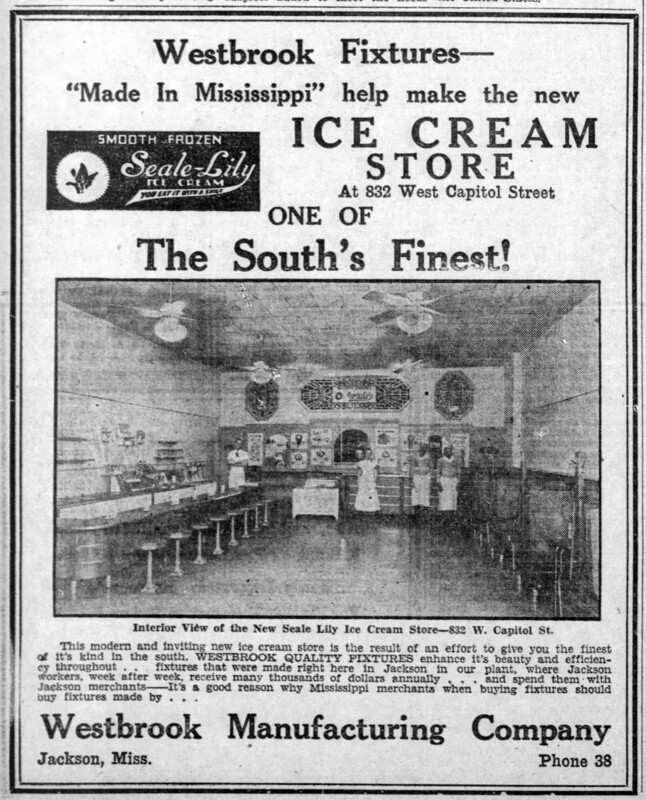 A couple of weeks ago, in preparation for the Seale-Lily Drive In post, I was doing some sleuthing around the internet for anything having to do with Seale-Lily Ice Cream, and I came upon this large advertisement in a March 1937 Clarion-Ledger for the then-new Seale-Lily on West Capitol Street. The photo of the Seale-Lily interior could qualify this post for the Going Inside series, but instead I was struck by the advertiser, Westbrook Manufacturing Company, a name I have seen here and there in many articles about new buildings but never really paid much attention to. This modern and inviting new ice cream store is the result of an effort to give you the finest of it’s [sic] kind in the south. WESTBROOK QUALITY FIXTURES enhance it’s [sic!] beauty and efficiency throughout . . . fixtures that were made right here in Jackson in our plant, where Jackson workers, week after week, receive many thousands of dollars annually . . . and spend them with Jackson merchants–It’s a good reason why Mississippi merchants when buying fixtures should buy fixtures made by . . .
Westbrook wasn’t exagerating about its role as a local manufacturer. It was founded in 1906 and had its plant on South Jefferson Street at South Street. Current aerial showing the large vacant parcel formerly occupied by Westbrook Manufacturing Company. Unfortunately, I’ve searched high and low in the newspapers for a photograph of the Westbrook plant, but have come up empty. I did find that the plant burned to the ground in a suspected arson fire in April 1911, and it was immediately rebuilt. I was surprised when looking at the Sanborn map above (the original is color-coded to show building materials) that after such a destructive fire, the plant was rebuilt out of wood rather than something less prone to fire, like brick. 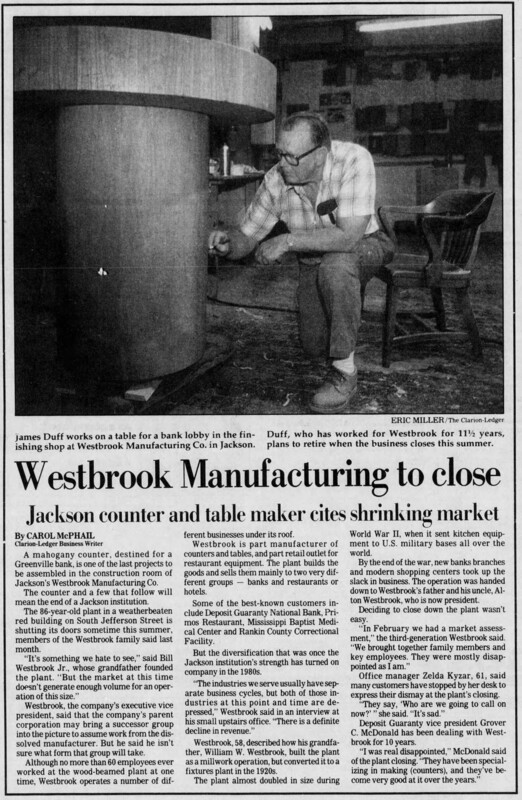 This March 1988 article in the Clarion-Ledger, a sad article about the impending closure of this longtime Jackson industry, gives some good information about the business and how it switched in the 1920s from a millwork operation to a fixtures manufacturer. The list of Westbrook’s best-known customers is also sad–more longtime Jackson institutions that have now vanished, either from being bought out like the late, lamented Deposit Guaranty, or moved out, like Primos. I wonder if even the Rankin County Correctional Facility still has its Westbrook fixtures? As for the W. Capitol Seale-Lily Ice Cream Parlor at 832 W. Capitol, the building is still standing, miraculously, across from Poindexter Park. But it’s been vacant for as long as I can remember, and I wonder what ever became of the Westbrook fixtures that were so snazzy back in 1937? The building still has a roof and has not burned; so, there is always the possibility that something survives inside, just waiting for someone to “restore” the building by ripping out everything on the inside and trucking it off to a landfill. Though, given the area’s severe decline to its current socioeconomic status and general lack of extant old buildings to restore, it might be a while before urban pioneers move on to West Capitol. Does anyone know why the Seale-Lily store had such a strange smell and throat-tickling atmosphere? I have seen quite a few Westbrook Manufacturing shop drawings in architectural records collections at MSU. Unfortunately, when they exist, they have to be found by knowing the building, as they are not traced in the plans descriptions. During my sleuthing, I realized what I never had connected–the founder of Westbrook Manufacturing was William Wall Westbrook, of the Westbrook home, now Mynelle Gardens, 4736 Clinton Boulevard, named for Mynelle Westbrook. The original Overstreet plans for the home did not survive, but Stan Wagnon donated the plans for the 2000 renovation of the home to MSU’s Overstreet Architectural Records. On the 1920-1940 censuses, William Westbrook is first listed as a lumber manufacturer and later a fixtures manufacturer. Although he was born in Mississippi, in 1900, he was a planer foreman in Kentwood, LA. It appears that this family was originally from South Carolina and settled in Monroe County, where William’s father was first listed as a mechanic and then a carpenter. It’s not too big a stretch to think that he may have learned woodwork from his Dad! Correction–that should have read 1910-1940 censuses. William Wall Westbrook apparently died in 1944, but I have not found a burial for him. great to see this interior view— i might well have been in the store in jackson, and the store in hattiesburg was ‘fairly similar’ as i recall; some of the other hburg folks in our ‘community’ should comment, too—weren’t the seats deep green? with other pale greens and pinks ‘around’ and, of course, all the chrome? am really straining my brain here. lots of new snow yesterday here in upstate ny, and, yes, i was tempted to make some snowcream–but, have so far avoided the flu this season and don’t want to take a chance on getting some other bugs from the ‘pretty’ but probably polluted snow! 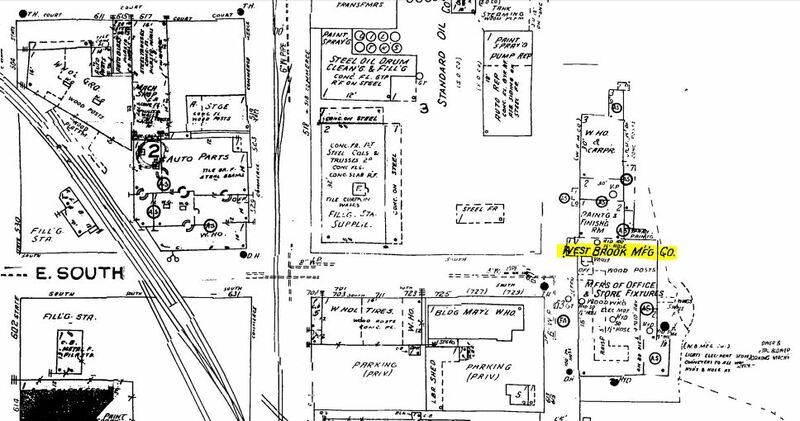 From Buzz Barnett, OH yes I was quite familiar with the West Capitol Street location. After they closed that location a “Shipley” doughnut shop opened . Regarding Westbrook Mfg. I believe they also did all the Stainless steel work for all the original “KRYSTALS” in Mississippi.